How to make a prepayment to your account? How does the Pay-as-you-go option work? This article is directed to users who prefer the Pay-as-you-go option to get icons and want to top up their account balance. To make a prepayment you will first need to go to Your account. 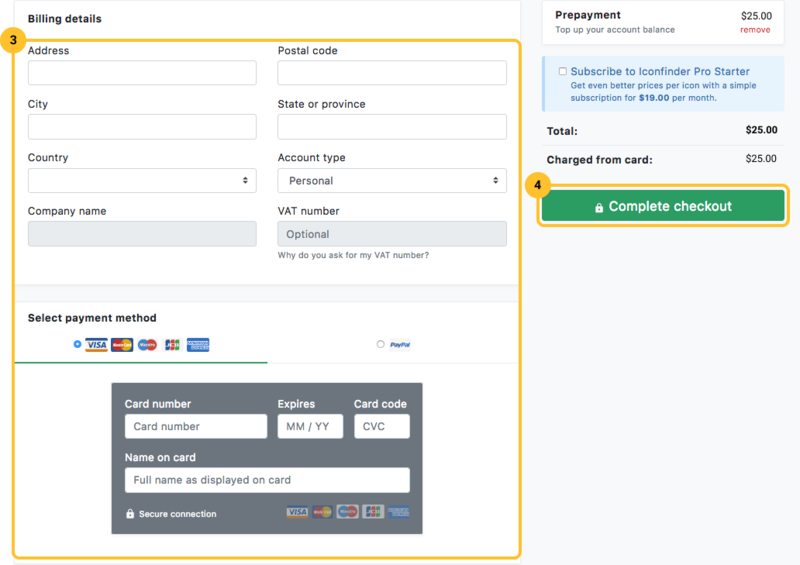 Select the amount you wish to prepay (1) and then click the Make a prepayment button (2) as showed below. You will be redirected to the following page. Make sure your billing details are correct (3) and complete the transaction by clicking on the Complete checkout button (4). The prepaid amount will be added to your account balance and the price of the icons that you buy will be paid out from there. Note: the minimum prepayment is $10.